This is the main working environment where up to three recipes can be displayed at one time. A new recipe can be loaded one material at a time by clicking the button which displays a list of materials to choose from. Load all the materials then enter the quantities. As the quantities are entered the unity formula is displayed in the left hand panel. A colourant can be loaded by clicking the icon which will open a window with a list of colourants. The recipe can be saved by clicking one of these buttons . There are various controls for a displayed recipe located under each recipe panel. You can copy a recipe into the next panel by using the button. The image below shows two limit graphs with the loaded recipe's unity formula displayed as yellow rectangels against bars and, in the case of Al2O3 and SiO2, a blue rectangle. Matrix is set to C.10 so the "limits" are those suggested for that temperature. Changing the tempeature in the main window will alter the position of the bars and blue rectangle. 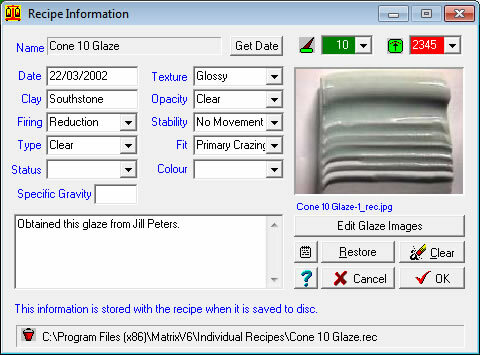 There are many more functions that Matrix will perform all designed to give you information about a displayed glaze so that you can make informed decisions about possible changes etc. Click an icon to see the window. This function lets you save a recipe with lots of quality options. You can attach a text file to each recipe which can preserve its history. This gives you access to the recipe's images. The window can hold up to 6 pictures. You can save the recipe to a database which can hold up to 100 recipes. This button will clear a recipe from the active recipe panel.